Roy Thompson is a singer songwriter who also runs Bag (Ballymore Accustic Gigs). Roy says, "I've had a guitar in my hand since I was a teenager, and been writing songs nearly as long. I'm flattered that folks have seemed to like them over the years. 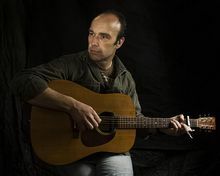 I've had some memorable gigs playing my songs - probably my best memory was opening for Jeffrey Foucault in Mother Redcaps in Dublin some years back. Anyway, even when busy with promotion, and not performing, I've found a little time to write, and I want to give those songs their wings.